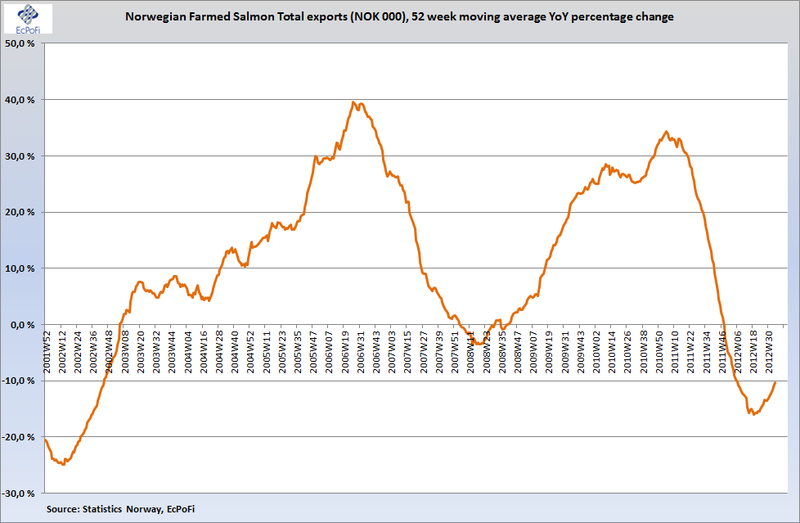 The trends, reported on EcPoFi every week, for Norwegian farmed salmon exports over the last few months have been a significant increase in tonnes exported, a decline in price and a net increase in the total value of the exports on a Year-on-Year (YoY) basis. You can also refer to the YTD Update as of week 33 for further background information. In this report, the exports are analysed on the same basis as in the weekly reports, but with a focus on the longer term trends as the YoY percentage changes are calculated on a rolling 52 week basis. The percentage increase in tonnes exported for the period ending last week was the highest ever recorded, increasing 23.18%. 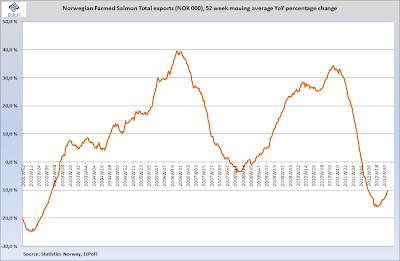 Since week 37 in 2002, tonnes exported has always increased except for the 52 week period ending week 11 2009. The average YoY percentage increase for the period analysed is 9.3% with a median of 9.4%. 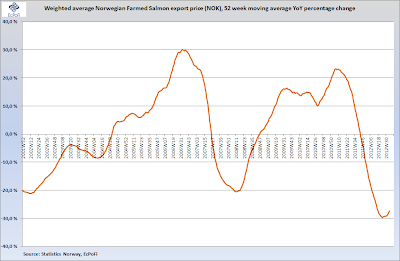 The current downturn in the growth rate in price per kilo of Norwegian farmed salmon started around week 6 in 2011 and appears to have bottomed out around week 22 this year. The longer term trend is still a drop in price, but the percentage reduction in price appears now to have turned for the better (lower rate of decline). 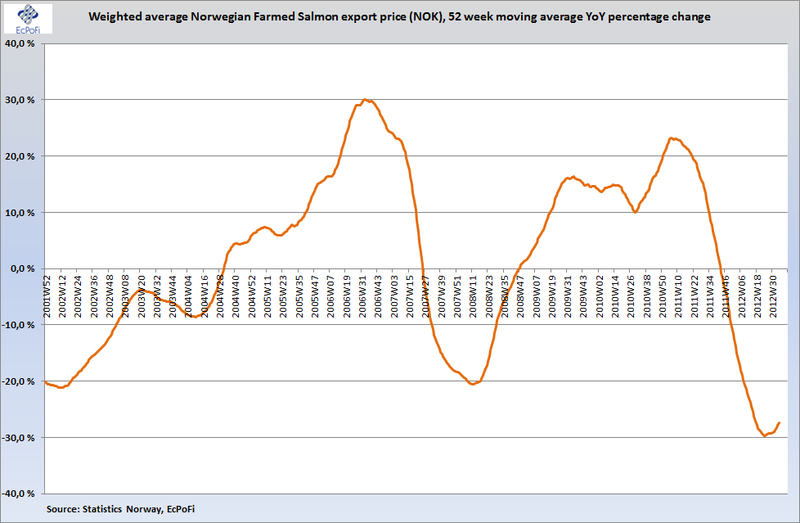 This trend is likely to continue as salmon prices dropped considerably at this time last year and current prices have increased (both in recent weeks and compared to beginning of the year). As price has fallen more than tonnes exported has increased, the percentage change in the value of exports has been in negative territory since week 49 in 2011. For the past 14 weeks or so however, the percentage drop has started slowing down signaling a change in the trend. 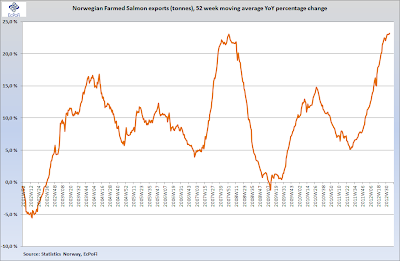 As tonnes exported appears to be on a very steady upward trend and with the increase in price seen this year, it appears likely that the YoY percentage increase in the total value of exports will again be in positive territory in a few weeks time. 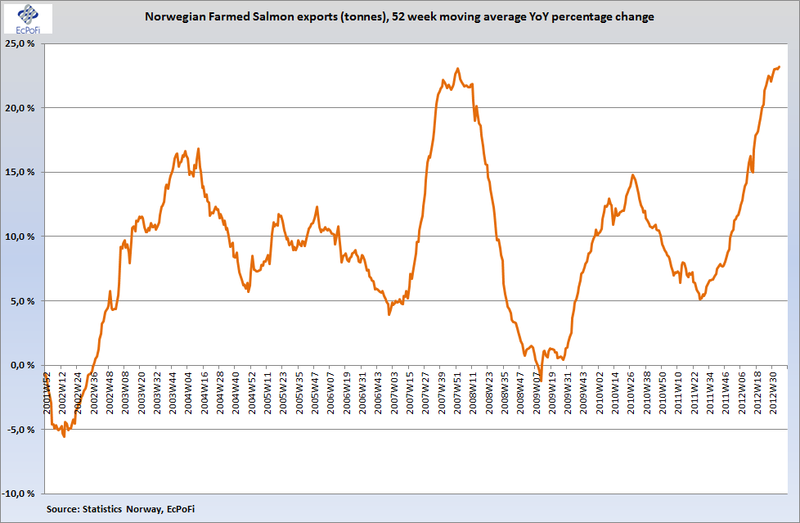 Disclaimer: I have long positions in some of the Norwegian farmed salmon exporters.